Join us every Friday and Saturday nights from 5:00 pm until 9:00 pm for succulent Prime Rib au jus with choice of potatoes, salad. We season prime beef roasts and then slowly roast them to tender perfection bringing out all the flavor and meatiness you crave. 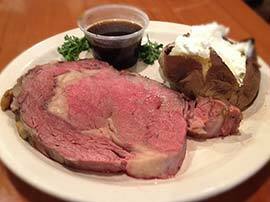 With au jus on the side and our horseradish sauce, you are in for a treat!